Quer saber como falar as horas em inglês dentro do período das 4 da manhã? Então siga essa aula, pois montamos uma tabela completa com todas as horas em inglês por extenso entre 04:00 a 04:59. Você vai aprender as diversas formas de se escrever os horários para cada minuto em inglês. Serão 60 minutos aonde cada minuto aprenderemos mais de uma forma de escrita. Então vamos começar os estudos. E para que você consiga memorizar mais fácil e rápido cada um desses nomes em inglês, recomendamos o uso do Anki, um ferramenta que vai te auxiliar em um processo de memorização chamado Spaced Repetition (Repetição Espaçada) que nada mais é do que você repetir o que acabou de aprender em intervalos de tempos maiores, ao invés de repetir logo no mesmo instante. Nesse tutorial completo explicamos em detalhes o que é o Anki e como baixar e configurar essa ferramenta. 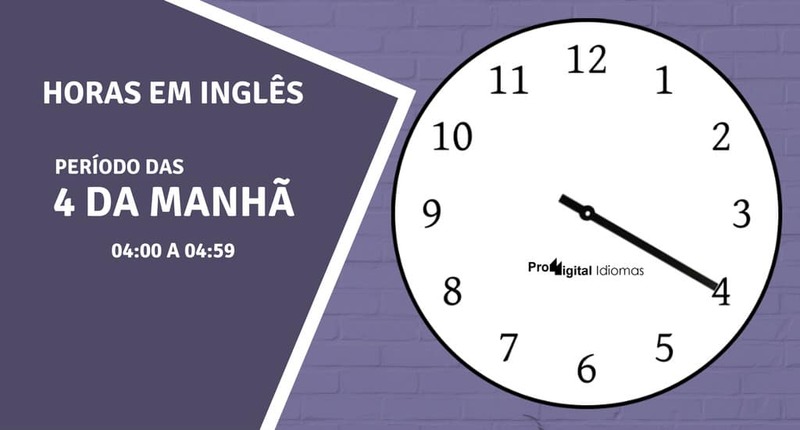 Começando nosso estudo sobre as horas em inglês para o período das 4 da manhã, vamos já colocar na nossa mente que o termo “o’clock” deve ser somente usado para especificar a hora exata (em ponto), assim como podemos ver na tabela abaixo. Então vamos ver como fica o uso desse termo, e depois vamos ver as outras formas de como falar as horas em inglês das 04:00 a 04:14. One minute past four One minute past four a.m.
One past four One past four a.m.
Fifty-nine minutes to five Fifty-nine minutes to five a.m.
Four one Four one a.m.
Two minutes past four Two minutes past four a.m.
Two past four Two past four a.m.
Fifty-eight minutes to five Fifty-eight minutes to five a.m.
Four two Four two a.m.
Three minutes past four Three minutes past four a.m.
Three past four Three past four a.m.
Fifty-seven minutes to five Fifty-seven minutes to five a.m.
Four three Four three a.m.
Four minutes past four Four minutes past four a.m.
Four past four Four past four a.m.
Fifty-six minutes to five Fifty-six minutes to five a.m.
Four four Four four a.m.
Five minutes past four Five minutes past four a.m.
Five past four Five past four a.m.
Fifty-five minutes to five Fifty-five minutes to five a.m.
Four five Four five a.m.
Six minutes past four Six minutes past four a.m.
Six past four Six past four a.m.
Fifty-four minutes to five Fifty-four minutes to five a.m.
Four six Four six a.m. Seven minutes past four Seven minutes past four a.m. Seven past four Seven past four a.m.
Fifty-three minutes to five Fifty-three minutes to five a.m.
Four seven Four seven a.m. Eight minutes past four Eight minutes past four a.m. Eight past four Eight past four a.m.
Fifty-two minutes to five Fifty-two minutes to five a.m.
Four eight Four eight a.m.
Nine minutes past four Nine minutes past four a.m.
Nine past four Nine past four a.m.
Fifty-one minutes to five Fifty-one minutes to five a.m.
Four nine Four nine a.m. Ten minutes past four Ten minutes past four a.m. Ten past four Ten past four a.m.
Fifty minutes to five Fifty minutes to five a.m.
Four ten Four ten a.m.
Eleven minutes past four Eleven minutes past four a.m.
Eleven past four Eleven past four a.m.
Forty-nine minutes to five Forty-nine minutes to five a.m.
Four eleven Four eleven a.m.
Twelve minutes past four Twelve minutes past four a.m.
Twelve past four Twelve past four a.m.
Forty-eight minutes to five Forty-eight minutes to five a.m.
Four twelve Four twelve a.m.
Thirteen minutes past four Thirteen minutes past four a.m.
Thirteen past four Thirteen past four a.m.
Forty-seven minutes to five Forty-seven minutes to five a.m.
Four thirteen Four thirteen a.m.
Fourteen minutes past four Fourteen minutes past four a.m.
Fourteen past four Fourteen past four a.m.
Forty-six minutes to five Forty-six minutes to five a.m.
Four fourteen Four fourteen a.m.
Após passado os 15 minutos, os nativos da língua inglesa usam o termo “a quarter past” para especificar os 15 minutos em inglês passados da hora exata. Vamos ver abaixo como podem falar isso, e como falar as horas em inglês entre 04:15 a 04:29. Fifteen minutes past four Fifteen minutes past four a.m.
Fifteen past four Fifteen past four a.m.
Forty-five minutes to five Forty-five minutes to five a.m.
Four fifteen Four fifteen a.m.
A quarter past four A quarter past four a.m.
Sixteen minutes past four Sixteen minutes past four a.m.
Sixteen past four Sixteen past four a.m.
Forty-four minutes to five Forty-four minutes to five a.m.
Four sixteen Four sixteen a.m.
Seventeen minutes past four Seventeen minutes past four a.m.
Seventeen past four Seventeen past four a.m.
Forty-three minutes to five Forty-three minutes to five a.m.
Four seventeen Four seventeen a.m.
Eighteen minutes past four Eighteen minutes past four a.m.
Eighteen past four Eighteen past four a.m.
Forty-two minutes to five Forty-two minutes to five a.m.
Four eighteen Four eighteen a.m.
Nineteen minutes past four Nineteen minutes past four a.m.
Nineteen past four Nineteen past four a.m.
Forty-one minutes to five Forty-one minutes to five a.m.
Four nineteen Four nineteen a.m.
Twenty minutes past four Twenty minutes past four a.m.
Twenty past four Twenty past four a.m.
Forty minutes to five Forty minutes to five a.m.
Four twenty Four twenty a.m.
Twenty-one minutes past four Twenty-one minutes past four a.m.
Twenty-one past four Twenty-one past four a.m.
Thirty-nine minutes to five Thirty-nine minutes to five a.m.
Four twenty-one Four twenty-one a.m.
Twenty-two minutes past four Twenty-two minutes past four a.m.
Twenty-two past four Twenty-two past four a.m.
Thirty-eight minutes to five Thirty-eight minutes to five a.m.
Four twenty-two Four twenty-two a.m.
Twenty-three minutes past four Twenty-three minutes past four a.m.
Twenty-three past four Twenty-three past four a.m.
Thirty-seven minutes to five Thirty-seven minutes to five a.m.
Four twenty-three Four twenty-three a.m.
Twenty-four minutes past four Twenty-four minutes past four a.m.
Twenty-four past four Twenty-four past four a.m.
Thirty-six minutes to five Thirty-six minutes to five a.m.
Four twenty-four Four twenty-four a.m.
Twenty-five minutes past four Twenty-five minutes past four a.m.
Twenty-five past four Twenty-five past four a.m.
Thirty-five minutes to five Thirty-five minutes to five a.m.
Four twenty-five Four twenty-five a.m.
Twenty-six minutes past four Twenty-six minutes past four a.m.
Twenty-six past four Twenty-six past four a.m.
Thirty-four minutes to five Thirty-four minutes to five a.m.
Four twenty-six Four twenty-six a.m.
Twenty-seven minutes past four Twenty-seven minutes past four a.m.
Twenty-seven past four Twenty-seven past four a.m.
Thirty-three minutes to five Thirty-three minutes to five a.m.
Four twenty-seven Four twenty-seven a.m.
Twenty-eight minutes past four Twenty-eight minutes past four a.m.
Twenty-eight past four Twenty-eight past four a.m.
Thirty-two minutes to five Thirty-two minutes to five a.m.
Four twenty-eight Four twenty-eight a.m.
Twenty-nine minutes past four Twenty-nine minutes past four a.m.
Twenty-nine past four Twenty-nine past four a.m.
Thirty-one minutes to five Thirty-one minutes to five a.m.
Four twenty-nine Four twenty-nine a.m.
Após passado os 30 minutos em inglês, os nativos da língua inglesa costumam usar o termo “half past” para especificar que já se passaram 30 minutos após a hora exata. Vamos ver abaixo como podemos escrever isso em inglês. E também vamos ver as diversas formas de como falar as horas em inglês entre 04:30 a 04:44. Thirty minutes past four Thirty minutes past four a.m.
Thirty past four Thirty past four a.m.
Thirty minutes to five Thirty minutes to five a.m.
Four thirty Four thirty a.m.
Half past four Half past four a.m.
Thirty-one minutes past four Thirty-one minutes past four a.m.
Thirty-one past four Thirty-one past four a.m.
Twenty-nine minutes to five Twenty-nine minutes to five a.m.
Four thirty-one Four thirty-one a.m.
Thirty-two minutes past four Thirty-two minutes past four a.m.
Thirty-two past four Thirty-two past four a.m.
Twenty-eight minutes to five Twenty-eight minutes to five a.m.
Four thirty-two Four thirty-two a.m.
Thirty-three minutes past four Thirty-three minutes past four a.m.
Thirty-three past four Thirty-three past four a.m.
Twenty-seven minutes to five Twenty-seven minutes to five a.m.
Four thirty-three Four thirty-three a.m.
Thirty-four minutes past four Thirty-four minutes past four a.m.
Thirty-four past four Thirty-four past four a.m.
Twenty-six minutes to five Twenty-six minutes to five a.m.
Four thirty-four Four thirty-four a.m.
Thirty-five minutes past four Thirty-five minutes past four a.m.
Thirty-five past four Thirty-five past four a.m.
Twenty-five minutes to five Twenty-five minutes to five a.m.
Four thirty-five Four thirty-five a.m.
Thirty-six minutes past four Thirty-six minutes past four a.m.
Thirty-six past four Thirty-six past four a.m.
Twenty-four minutes to five Twenty-four minutes to five a.m.
Four thirty-six Four thirty-six a.m.
Thirty-seven minutes past four Thirty-seven minutes past four a.m.
Thirty-seven past four Thirty-seven past four a.m.
Twenty-three minutes to five Twenty-three minutes to five a.m.
Four thirty-seven Four thirty-seven a.m.
Thirty-eight minutes past four Thirty-eight minutes past four a.m.
Thirty-eight past four Thirty-eight past four a.m.
Twenty-two minutes to five Twenty-two minutes to five a.m.
Four thirty-eight Four thirty-eight a.m.
Thirty-nine minutes past four Thirty-nine minutes past four a.m.
Thirty-nine past four Thirty-nine past four a.m.
Twenty-one minutes to five Twenty-one minutes to five a.m.
Four thirty-nine Four thirty-nine a.m.
Forty minutes past four Forty minutes past four a.m.
Forty past four Forty past four a.m.
Twenty minutes to five Twenty minutes to five a.m.
Four forty Four forty a.m.
Forty-one minutes past four Forty-one minutes past four a.m.
Forty-one past four Forty-one past four a.m.
Nineteen minutes to five Nineteen minutes to five a.m.
Four forty-one Four forty-one a.m.
Forty-two minutes past four Forty-two minutes past four a.m.
Forty-two past four Forty-two past four a.m.
Eighteen minutes to five Eighteen minutes to five a.m.
Four forty-two Four forty-two a.m.
Forty-three minutes past four Forty-three minutes past four a.m.
Forty-three past four Forty-three past four a.m.
Seventeen minutes to five Seventeen minutes to five a.m.
Four forty-three Four forty-three a.m.
Forty-four minutes past four Forty-four minutes past four a.m.
Forty-four past four Forty-four past four a.m.
Sixteen minutes to five Sixteen minutes to five a.m.
Four forty-four Four forty-four a.m.
Após passados os 45 minutos em inglês, temos a opção de também dizer que faltam 15 minutos para o próximo horário. E nesse caso, os nativos do idioma inglês costumam usar o termo “a quarter to” que significa que falta 1/4 para a próxima hora. Vamos ver abaixo como fica essa escrita com esse termo, e também ver como falar as horas em inglês entre 04:45 a 04:59. Forty-five minutes past four Forty-five minutes past four a.m.
Forty-five past four Forty-five past four a.m.
Fifteen minutes to five Fifteen minutes to five a.m.
Four forty-five Four forty-five a.m.
A quarter to five A quarter to five a.m.
Forty-six minutes past four Forty-six minutes past four a.m.
Forty-six past four Forty-six past four a.m.
Fourteen minutes to five Fourteen minutes to five a.m.
Four forty-six Four forty-six a.m.
Forty-seven minutes past four Forty-seven minutes past four a.m.
Forty-seven past four Forty-seven past four a.m.
Thirteen minutes to five Thirteen minutes to five a.m.
Four forty-seven Four forty-seven a.m.
Forty-eight minutes past four Forty-eight minutes past four a.m.
Forty-eight past four Forty-eight past four a.m.
Twelve minutes to five Twelve minutes to five a.m.
Four forty-eight Four forty-eight a.m.
Forty-nine minutes past four Forty-nine minutes past four a.m.
Forty-nine past four Forty-nine past four a.m.
Eleven minutes to five Eleven minutes to five a.m.
Four forty-nine Four forty-nine a.m.
Fifty minutes past four Fifty minutes past four a.m.
Fifty past four Fifty past four a.m. Ten minutes to five Ten minutes to five a.m.
Four fifty Four fifty a.m.
Fifty-one minutes past four Fifty-one minutes past four a.m.
Fifty-one past four Fifty-one past four a.m.
Nine minutes to five Nine minutes to five a.m.
Four fifty-one Four fifty-one a.m.
Fifty-two minutes past four Fifty-two minutes past four a.m.
Fifty-two past four Fifty-two past four a.m. Eight minutes to five Eight minutes to five a.m.
Four fifty-two Four fifty-two a.m.
Fifty-three minutes past four Fifty-three minutes past four a.m.
Fifty-three past four Fifty-three past four a.m. Seven minutes to five Seven minutes to five a.m.
Four fifty-three Four fifty-three a.m.
Fifty-four minutes past four Fifty-four minutes past four a.m.
Fifty-four past four Fifty-four past four a.m.
Six minutes to five Six minutes to five a.m.
Four fifty-four Four fifty-four a.m.
Fifty-five minutes past four Fifty-five minutes past four a.m.
Fifty-five past four Fifty-five past four a.m.
Five minutes to five Five minutes to five a.m.
Four fifty-five Four fifty-five a.m.
Fifty-six minutes past four Fifty-six minutes past four a.m.
Fifty-six past four Fifty-six past four a.m.
Four minutes to five Four minutes to five a.m.
Four fifty-six Four fifty-six a.m.
Fifty-seven minutes past four Fifty-seven minutes past four a.m.
Fifty-seven past four Fifty-seven past four a.m.
Three minutes to five Three minutes to five a.m.
Four fifty-seven Four fifty-seven a.m.
Fifty-eight minutes past four Fifty-eight minutes past four a.m.
Fifty-eight past four Fifty-eight past four a.m.
Two minutes to five Two minutes to five a.m.
Four fifty-eight Four fifty-eight a.m.
Fifty-nine minutes past four Fifty-nine minutes past four a.m.
Fifty-nine past four Fifty-nine past four a.m.
One minute to five One minute to five a.m.
Four fifty-nine Four fifty-nine a.m.
E fim da nossa tabela completa aonde pudemos aprender todas as horas em inglês por extenso. Espero que tenha gostado da aula. Revise mais e mais vezes essa tabela para que seu cérebro grave definitivamente todas as formas de se dizer os horários em inglês. E não deixe de baixar o Anki aí no seu celular ou computador para te ajudar a memorizar mais e melhor as palavras e frases.